Learn which flow, pressure, level and temperature equipment works best in each phase of the process. Wastewater originates from many sources, including industrial activities, domestic use, various farming and agricultural processes, medical waste and transportation. It refers to water that has been fundamentally changed—usually in fluid quality or composition but also including temperature. But what happens to the water? Everyone has heard of wastewater treatment plants, but what is happening, and how is it accomplished? 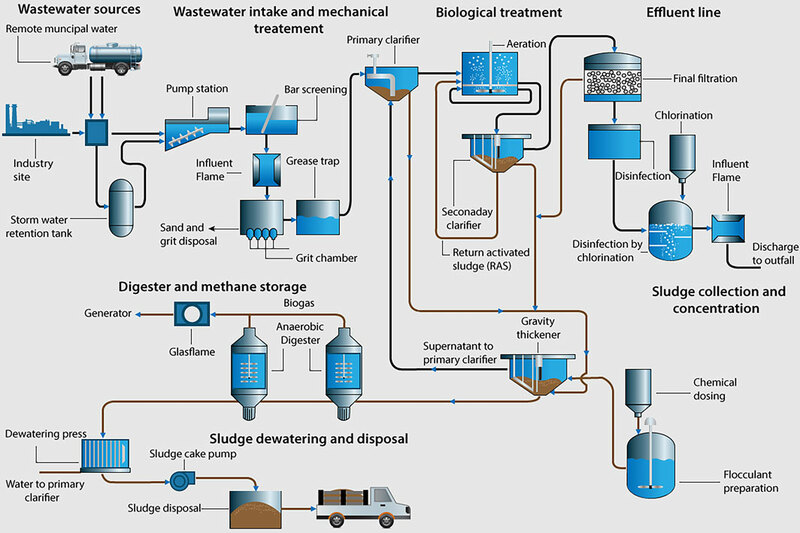 This article delves into basic principles of wastewater treatment as well as solutions for each process. The wastewater treatment industry requires continuous process measurement systems and control. Most sources of wastewater originate from agricultural, industrial or domestic use. Initially, the goal of wastewater treatment is to remove rough or crude solids and other large containments from raw water. During this initial process (referred to as the grit channel process), the velocity of incoming wastewater is controlled, allowing most of the sand, grit and stones to settle to the bottom of the channel while retaining most of the suspended organic material in the water. This process can use all basic aspects of measurement (flow, pressure, level and temperature). An electromagnetic flow meter is typically recommended because the water flows directly through the meter. Contact instruments are used for measuring the volumetric flow rates of any fluid that can adequately conduct electricity in closed pipelines. An explosion-proof differential pressure transmitter can be the ideal choice in this instance. It uses a capacitance pressure sensor to measure differential pressure. This sensor is often selected in level monitoring applications to measure liquid and gas, and to remove steam. An ultrasonic level transmitter offers continuous measurement of the levels and volumes of media in open and closed tanks. It also provides flow measurement in open channels through the use of ultrasonic waves. An explosion-proof temperature transmitter is often recommended. This is a microprocessor-based, high-performance temperature transmitter. It includes flexible sensor input and output, automatic compensation of ambient temperature, and a self-diagnostic function to determine the error in the instrument and alert the user. The secondary treatment process consists of a biological treatment. It includes anaerobic as well as aerobic processes. The main purpose of this process is to reduce and remove the concentration of organic and inorganic compounds. This is important because up to 90 percent of organic matter can be successfully removed through it. The biological treatment uses specific microorganisms such as bacteria and protozoa to break down and decompose organic matter. Following this treatment, a water pump is used as a secondary clarifier. This process can use flow, pressure and temperature measurement. The recommended instruments often are an electromagnetic flow meter, an explosion-proof differential pressure transmitter and an explosion-proof temperature transmitter. The sludge produced by primary and secondary treatments is roughly 99 percent water. A thickening tank is used to collect the sludge, let it settle, and separate from the water within a 24-hour period. Then the water is sent back to the aeration tanks for further treatment. For this process, flow and level measurement are important. Either an electromagnetic flow meter or a vortex flow meter is a good fit. A vortex flow meter is a versatile instrument that calculates the mass flow, volumetric flow rate, temperature, pressure and density of any liquid, gas or steam through a pipeline by using the vortex shedding principle. An ultrasonic level transmitter is a good option. Post thickening, the sludge is treated to make it safer for the environment. The sludge is placed in an oxygen-free tank called the digester and heated up to 90 F to 95 F for 15 to 20 days. This stimulates growth of anaerobic bacteria that consume the organic material in the sludge. The digestion process stabilizes the thickened sludge by converting much of the material into water, carbon dioxide and methane gas. The black sludge that remains after digestion has the consistency of pea soup and has little color. This process can use all four basic aspects of measurement (flow, pressure, level and temperature). Electromagnetic flow meters, ultrasonic level transmitters, explosion-proof differential pressure transmitters and explosion-proof temperature transmitters are often recommended. Dewatering reduces the liquid volume of sludge. Digested sludge is sent through centrifuges that operate like the spin cycle of a washing machine. The force from the centrifuges separates most of the water from the solids in the sludge, creating a substance known as biosolids. Adding organic polymer improves the consistency of the now cakelike substance, resulting in a firmer and more manageable product. For this process flow, level and pressure should be measured. An electromagnetic flow meter and an explosion-proof differential pressure transmitter are recommended. For level, a radar level transmitter is usually recommended. This is a device that uses radar technology for continuous measurement of the levels of different types of media. The key advantage of this device is its ability to take accurate measurements under extreme temperature and pressure conditions. It is not affected by density, viscosity or the conductivity of the medium. It can also be used to measure levels of corrosive, viscous and abrasive materials without suffering any damage.